The oldest term for abbreviation, = νοταρικόν, is found in tannaitic literature as early as 150 B.C. (Krauss, "Lehnwörter," ii. s.v. ; Bacher, "Die Älteste Terminologie"). Authorities of the third century use also the term (later ) = σημειου (according to Krauss, "Lehnwörter," and , Yoma, 37b; Giṭ. 60a), and, for a certain kind of abbreviation, (Yoma, 38a; Giṭ. ib.). In the fourth century is met the expression (Tan. Ex., ed. Buber, fol. 54a), a term which must have been in common use, since the Maghrebi Arabic ruus ḥuruf is borrowed from it. In later literature the common expression is (heads of words), first found in the Masora, and, for another kind, (ends of words) (Frensdorff, "Die Masora Magna," glossary). Elias Levita, the first writer on the subject, refers to Abbreviations as contractions and fragments, the words being in Abbreviations and initials, in the manner of suggestions and contractions (as a broken word). Joseph Ḳalman ( , iii.) calls them . Compare the Arabic ḥarf muḳtiah. Among the cabalists a certain kind of abbreviation or combination of letters is called or . The verb is already found in the Talmud (Ber. 55a) and in the (ii. 2 et passim). Later writers use for the term (S. Donnolo) or (A. Abulafia). For the verbs or one finds also (Naḥmanides' commentary to , ib.) and (J. S. del Medigo, ), and the nouns and also occur. The terms νοταρικόν = notaricum, and σημειον originally denoted shorthand signs, but among the Jews they received the meaning "Abbreviations." For the doubtful expressions or and , see Krauss, "Lehnwörter," and Jastrow, "Dict." Abbreviations really begin with the development of the Hebrew alphabet out of ideographic pictures. Hence, they must date from the earliest times. The modern letters were originally signs or symbols. After the symbols had become letters, representing not only concepts, but sounds, the names were, nevertheless, retained and transferred to the corresponding sounds. The time when that transfer took place is unknown; but it may be assumed that even for some time later ideograms for well-known words were still used. By analogy with those ideograms the use of conventional signs for frequently recurring words probably came into vogue, and this was the beginning of Abbreviations (compare Perles, "Analekten," p. 10). Abbreviations are found in Punic, Assyrian, and Minean inscriptions, and also in an Aramaic inscription of the year 526 B.C. (compare Perles, op. cit.). At first but few in number, lack of space, economy of writing material, a desire for secrecy, religious scruples, and the convenience of the writer multiplied their number to the extent found to-day. Thus, on the Maccabean coins are found the Abbreviations א for "first year": for "second, third, fourth year"; for "the Jews"; or for "Israel"; for "of freedom," produced for lack of space (Théodore Reinach, "Monnaies Juives," p. 44). The abbreviation for or , common in the Mishnah, is due to the convenience of the writer. The abbreviation or for is due to religious scruples. The numerous Abbreviations found in the Masorah are due to lack of space, scarcity of writing material, and the convenience of the scribe. Some scholars, being unused to writing, signed sigla for their names (Giṭ. 36a). In times of religious persecution certain sacred objects were marked with sigla (Ma'as. Sh. iv. 11). On the Maccabean coins there is no sign to denote abbreviation. This may be due to lack of space. However, such a practise is met with much later; compare the Bible fragments published by Neubauer ("Jew. Quart. Rev." vii. 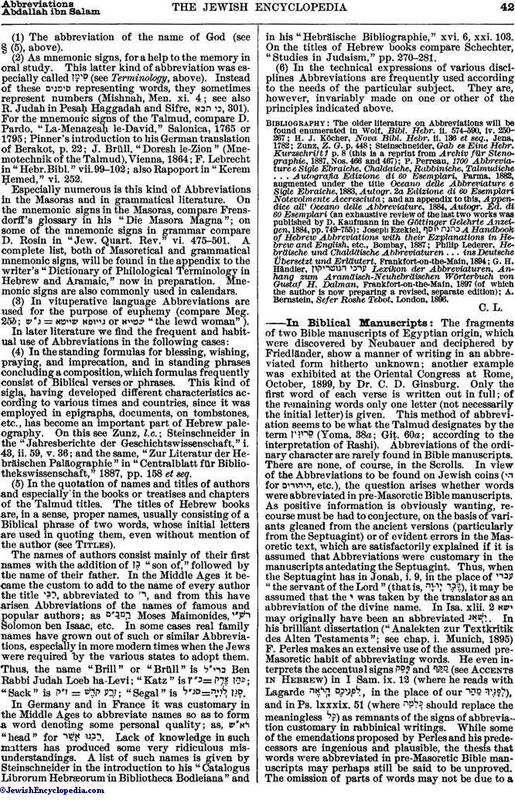 363) and (Lowe, "A Fragment of the Talmud Bab. Pesaḥim," fol. 8a, col. 1, l. 5). The Punic inscription ("Corpus Inscrip. Semit." i. No. 170) omits after the abbreviated word the dot otherwise found at the end of every word written out in full. A similar mode of marking Abbreviations might have existed also among the Jews. In medieval writings Abbreviations marked by various signs are found. Thus, in the "Talmudical Fragments," published by Schechter and Singer (Cambridge, 1896), one and three dots are found: (p. 28, l. 17), (p. 27, ll. 23, 24), (p. 28, l. 17), = 4883 A.M. (p. 26, l. 24). In the Talmudical fragment published by Lowe (Cambridge, 1879) are seen the single dot, the double dot, and the single line slanting in two directions, while the double slanting line is used for a full stop: = (fol. 1a, col. 2, l. 8); = (l. 9); (fol. 1b, col. 1, l. 19); (fol. 8b, col. 2, ll. 19, 21, 29); (fol. 2a, col. 2, l. 19); (fol. 2b, col. 2, 1. 6). In the manuscript fragment published by C. Levias in the "Am. Jour. Semit. Lang." xv. there are, besides the dot, the horizontal line and the semi-circle: (p. 162). In the Arabic period is found the Arabic sign  (Steinschneider, "Gab es Eine Hebräische Kurzschrift?" p. 6). With the abbreviated name of God sometimes there occurs a broken line z or Ʒ (Perles, "Analekten," p. 26, note 1; Greenburg, "The Haggadah According to the Rite of Yemen," p. 1; Kohut, "Aboo Manzûr al-Dhamâri," p. 15). In addition to the sign above the abbreviated word, the last remaining letter is at times not written out in full; for example, = (Lowe, "A Fragment of the Talmud," fol. 1a, col. 1, l. 21), (fol. 7b, col. 1, l. 1). In modern times two signs only are used—the single and the double slanting lines. The single line is used at the end of an abbreviated single word; for example, or . The double line is used between the letters of an abbreviation of two or more words; for example, or = . (1) : When a single word consists of only two letters it is very rarely abbreviated; for example, . When it consists of more than two letters, one or more of the final letters are dropped: for example, or = or or = or . Words beginning with a preposition or conjunction or verbs in the imperfect can not be abbreviated to one letter: for example, , Compound names are treated sometimes as two words, and so abbreviated: for example, = . (2) : The middle of a word is omitted, both ends remaining: for example, ("Am. Jour. Semit. Lang." xv. 162); (in the same place); ("Jew. Quart. Rev." xi. 646); (in the same place). This mode of abbreviation is very rare. (3) : A middle letter stands for the whole word. Of this kind only one example is known, namely, (compare Perles, op. cit. p. 16). (4) : The beginning of the word is omitted; for example, ("Am. Jour. Semit. Lang." xv. 162), or before family names; especially common in the Arabic period, but affected also by some modern writers. (6) :(a) The initial letter of every word, whether it be a radical or a formative element or an inseparable particle, is retained—the rest is omitted; for example, . It is to be noticed, however, that, if the first word of the combination begins with an inseparable particle, such particle is not counted; for example, = . An exception to this rule is the article in combination beginning with for example, , and , but more usually written . (b) Two letters are retained of one or several words; for example, ; . (c) When the first or last word of the combination is short, it is sometimes retained in the abbreviation entire; for example, ; . (d) When an abbreviation is formed of a larger complex of words the resulting lengthy abbreviation is rarely written in one group (for example, ), but is frequently broken up into two or more groups; for example, = = This splitting up into groups is at times guided by no principle (for example, ), but more frequently the tendency is apparent to form such groups as would make sense when read as entire words, or would represent a series of numbers, or would give a certain assonance; for instance, gives the words gives the words gives the words yields an assonance when pronounced (compare Pronunciation, below); gives the serial numbers 21, 22, 23. (e) In longer groups, particles and sometimes one or more whole words may be left unrepresented; for example, (Lowe, "A Fragment of the Talmud," fol. 1a, col. 1, 1. 21). (f) A species of Abbreviations consists in the use of the letters with numerical value. Such use goes back to antiquity, and was already known to the authors of the Biblical books (compare Holzinger to Gen. xiv. 14, and Bertholet to Ezek. iv. 5, in Marti's "Kurzer Hand-Kommentar zum Alten Testament"). On this use is also based the hermeneutic rule of Gematria. These letters with numerical value may be written by themselves, as, = 310; = 613; or together, with the Abbreviations of words, as, It is further to be noticed that in modern times the use of for 15, 16 is avoided (such groups being part of the divine name) and substituted in their stead. In some cases the numeral is written and pronounced with allusion to the meaning "alive," "living," which the word has in Hebrew. (g) : Sometimes the final letters of several words are combined into a group. This, where the initials make no sense, is done for mnemotechnic purposes; for example, . (h) : When quoting Scriptural passages, on account of religious scruples, only the first word is written out in full, the rest being given in Abbreviations. This mode is especially common among Karaitic authors (compare "Jew. Quart. Rev." vii. 363). (i) : The mystic combination of letters, to which dynamic powers were attributed, dates from the early Gnosis, and was very common in the Middle Ages. This kind of abbreviation does not properly belong to our subject. On the origin of such , compare Grätz, "Gnosticismus im Judenthum," p. 106, and , viii. 90; see also the articles Cabala and Notarikon. (1) Owing to the fact that Abbreviations were frequently formed into groups which, when read as a word, gave a meaning and were used as a help to the memory in oral study, all kinds of Abbreviations, even such as have no meaning when taken as words, came in later times to be pronounced with supplied vowels; for example, (B. B. 46b), (, vii. 96), (ib. 98). This is especially common with names of authors and books; for example, ; Equally frequent is such pronunciation of numbers, especially of more than two places; for example, . (2) Such pronounced Abbreviations are accepted in modern literature as real words, and even form derivatives. They are used both in prose and in poetry, and the abbreviation signs are not always written —a source of perplexity to the uninitiated. Compare , "the heresy of Shabbethai Ẓebi," from , the initials of that name (Gottlober, "Toledot haḲabbalah," p. 11); , "a poem the numerical value of whose letters in every line is equivalent to the date of the year in which it was composed" ( , p. 30, note):618 = 618 = 618 = 618 = (Gottlober, "Toledot ha-Ḳabbalah," p. 31). This poem yields the , "the date of the year with the omission of the thousands." Hence, 618 = 5618 A.M. = 1858 B.C. (see also "Luaḥ Aḥiasaf," ii. 31; Dolitzky, "Shire Menahem," p. 105). (1) The abbreviation of the name of God (see § (5), above). (2) As mnemonic signs, for a help to the memory in oral study. This latter kind of abbreviation was especially called (see Terminology, above). Instead of these representing words, they sometimes represent numbers (Mishnah, Men. xi. 4; see also R. Judah in Pesaḥ Haggadah and Sifre, , 301). 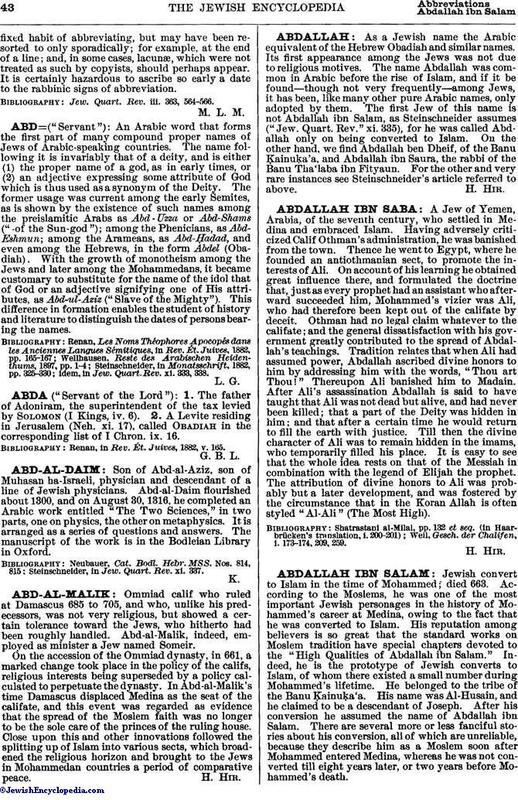 For the mnemonic signs of the Talmud, compare D. Pardo, "La-Menaẓeaḥ le-David," Salonica, 1765 or 1795; Pinner's introduction to his German translation of Berakot, p. 22; J. Brüll, "Doresh le-Zion" (Mnemotechnik of the Talmud), Vienna, 1864; F. Lebrecht in "Hebr.Bibl." vii. 99-102; also Rapoport in "Kerem Ḥemed," vi. 252.Especially numerous is this kind of Abbreviations in the Masoras and in grammatical literature. On the mnemonic signs in the Masoras, compare Frensdorff's glossary in his "Die Masora Magna"; on some of the mnemonic signs in grammar compare D. Rosin in "Jew. Quart. Rev." vi. 475-501. 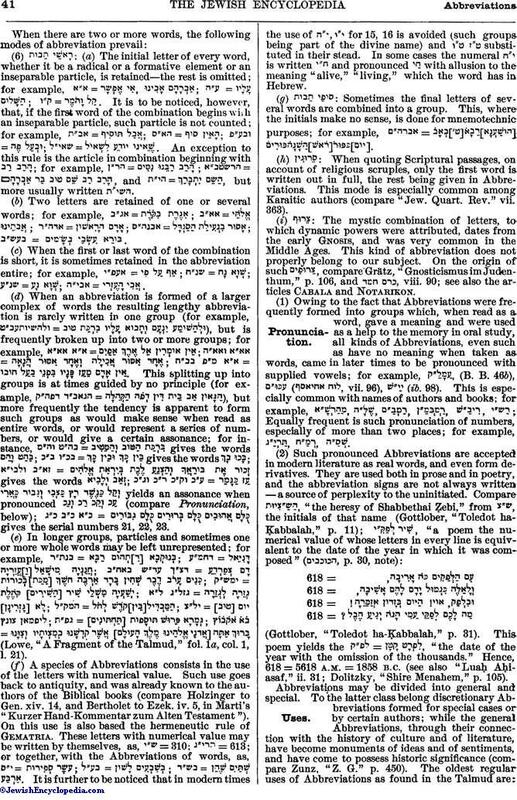 A complete list, both of Masoretical and grammatical mnemonic signs, will be found in the appendix to the writer's "Dictionary of Philological Terminology in Hebrew and Aramaic," now in preparation. Mnemonic signs are also commonly used in calendars. (4) In the standing formulas for blessing, wishing, praying, and imprecation, and in standing phrases concluding a composition, which formulas frequently consist of Biblical verses or phrases. This kind of sigla, having developed different characteristics according to various times and countries, since it was employed in epigraphs, documents, on tombstones, etc., has become an important part of Hebrew paleography. On this see Zunz, l.c. ; Steinschneider in the "Jahresberichte der Geschichtswissenschaft," i. 43, ii. 59, v. 36; and the same, "Zur Literatur der Hebräischen Paläographie" in "Centralblatt für Bibliothekswissenschaft," 1887, pp. 158 et seq. (5) In the quotation of names and titles of authors and especially in the books or treatises and chapters of the Talmud titles. 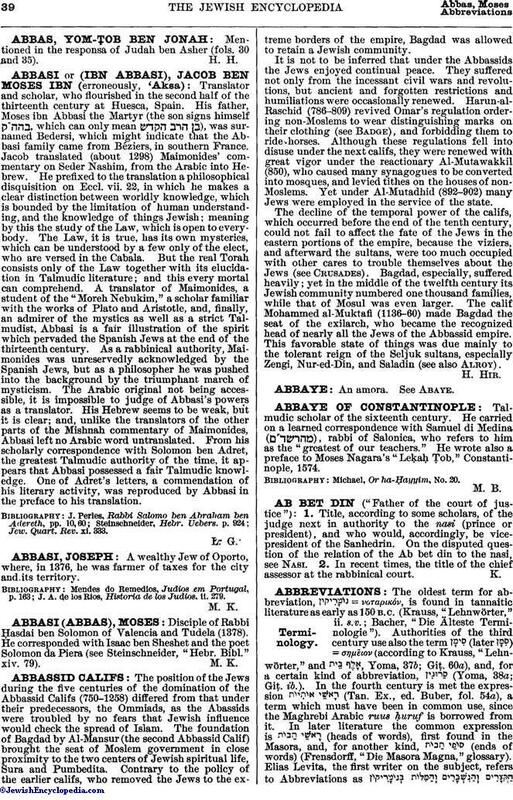 The titles of Hebrew books are, in a sense, proper names, usually consisting of a Biblical phrase of two words, whose initial letters are used in quoting them, even without mention of the author (see Titles).The names of authors consist mainly of their first names with the addition of "son of," followed by the name of their father. In the Middle Ages it became the custom to add to the name of every author the title , abbreviated to , and from this have arisen Abbreviations of the names of famous and popular authors; as Moses Maimonides, Solomon ben Isaac, etc. In some cases real family names have grown out of such or similar Abbreviations, especially in more modern times when the Jews were required by the various states to adopt them. Thus, the name "Brill" or "Brüll" is Ben Rabbi Judah Loeb ha-Levi; "Katz" is ; "Sack" is ; "Segal" is In Germany and in France it was customary in the Middle Ages to abbreviate names so as to form a word denoting some personal quality; as, "head" for . Lack of knowledge in such mattters has produced some very ridiculous misunderstandings. A list of such names is given by Steinschneider in the introduction to his "Catalogus Librorum Hebræorum in Bibliotheca Bodleiana" and in his "Hebräische Bibliographie," xvi. 6, xxi. 103. On the titles of Hebrew books compare Schechter, "Studies in Judaism," pp. 270-281. (6) In the technical expressions of various disciplines Abbreviations are frequently used according to the needs of the particular subject. They are, however, invariably made on one or other of the principles indicated above. A. Bernstein, Sefer Roshe Tebot, London, 1896. The fragments of two Bible manuscripts of Egyptian origin, which were discovered by Neubauer and deciphered by Friedländer, show a manner of writing in an abbreviated form hitherto unknown; another example was exhibited at the Oriental Congress at Rome, October, 1899, by Dr. C. D. Ginsburg. Only the first word of each verse is written out in full; of the remaining words only one letter (not necessarily the initial letter) is given. This method of abbreviation seems to be what the Talmud designates by the term (Yoma, 38a; Giṭ. 60a; according to the interpretation of Rashi). Abbreviations of the ordinary character are rarely found in Bible manuscripts. There are none, of course, in the Scrolls. In view of the Abbreviations to be found on Jewish coins ( for , etc. ), the question arises whether words were abbreviated in pre-Masoretic Bible manuscripts. 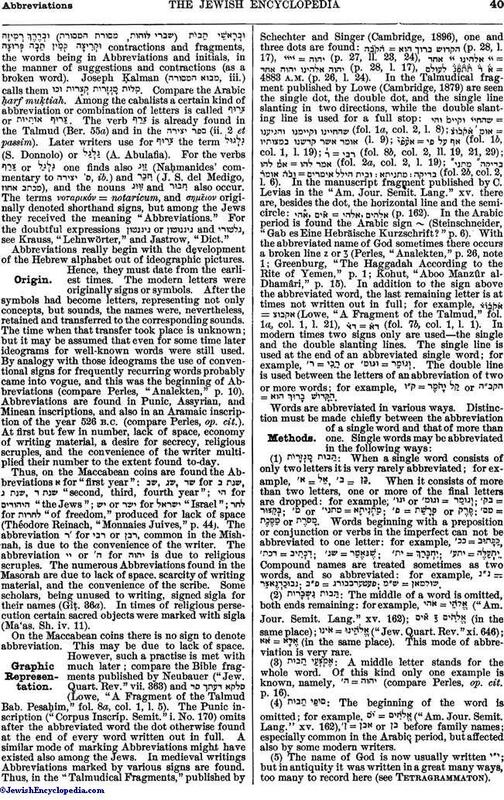 As positive information is obviously wanting, recourse must be had to conjecture, on the basis of variants gleaned from the ancient versions (particularly from the Septuagint) or of evident errors in the Masoretic text, which are satisfactorily explained if it is assumed that Abbreviations were customary in the manuscripts antedating the Septuagint. Thus, when the Septuagint has in Jonah, i. 9, in the place of "the servant of the Lord" (that is, ), it may be assumed that the was taken by the translator as an abbreviation of the divine name. In Isa. xlii. 2 may originally have been an abbreviated . In his brilliant dissertation ("Analekten zur Textkritik des Alten Testaments"; see chap. i. Munich, 1895) F. Perles makes an extensive use of the assumed pre-Masoretic habit of abbreviating words. He even interprets the accentual signs and (see Accents in Hebrew) in I Sam. ix. 12 (where he reads with Lagarde , in the place of our ), and in Ps. lxxxix. 51 (where should replace the meaningless ) as remnants of the signs of abbreviation customary in rabbinical writings. While some of the emendations proposed by Perles and his predecessors are ingenious and plausible, the thesis that words were abbreviated in pre-Masoretic Bible manuscripts may perhaps still be said to be unproved. The omission of parts of words may not be due to afixed habit of abbreviating, but may have been resorted to only sporadically; for example, at the end of a line; and, in some cases, lacunæ, which were not treated as such by copyists, should perhaps appear. It is certainly hazardous to ascribe so early a date to the rabbinic signs of abbreviation. Jew. Quart. Rev. iii. 363, 564-566.